There have been numerous incarnations of Lang's landmark science fiction epic over the decades, and just as many home video versions. All of them were rendered obsolete last year when an astonishing new digitally-restored version began touring the arthouse circuit. That version has now been released on DVD. Eureka video's two-disc Region 2 release presents what will doubtless remain the definitive version for some time. Certainly the restoration work here is a significant improvement over the best of the previous DVD versions (the excellent French R2 version released in 1999 by Films Sans Frontiéres). Sadly, all the restoration work imaginable won't change the fact that about a quarter of the film is missing, and almost certainly lost to the ether. 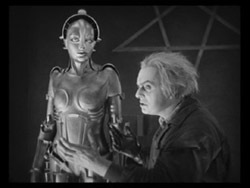 We'll never know precisely how Metropolis was structured when it premiered, although there are plenty of clues as to Lang's intentions (including detailed notes on the manuscript prepared for the conductor of the film's musical score). As usual, the 2002 version bridges the missing segments with captions and intertitles. On DVD this translates to a total running time of 118'32". Comparing the 2002 restoration to previous home video releases of the film is a little pointless. Every print has its own nuances, strengths and weaknesses. Any attempt to create a definitive version of the film must stitch together a patchwork of material from a multitude of different sources (including versions which feature alternate takes). Eureka's version offers something fundamentally new: it is the first version to use digital technology in an attempt to minimise the textural differences between these different prints and different film stocks. It also greatly improves over previous versions by offering greater stability (most of the film hops on shot changes have been eliminated, making the film much more palatable to modern audiences). The best version of the film available prior to the Eureka disc was the Films Sans Frontiéres DVD, which contained an earlier restoration attempt by the same team, and Eureka's presentation quite literally knocks spots off it! The difference between the Films Sans Frontiéres version (the best home video presentation prior to Eureka's digitally restored release) is demonstrated in the following practically random frame grabs. (They're as close to being the same frame as possible, although they seem to be from different takes). The most obvious differences are the framing (a significant amount of picture information is cropped off all four sides of old version, and the image is wildly off-centre), and the contrast (Helm practically disappears from the knees down on the old print). The new print also also much cleaner, although, naturally, this is far more evident when the image is moving. 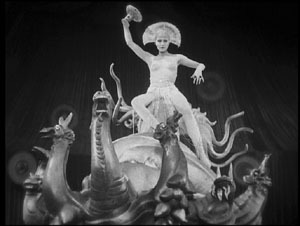 The 2002 version of this particular shot also more clearly displays Lang's use of a vignette to frame his images (he uses the technique throughout the film, most obviously in "the legend of the Tower of Babel" sequence). The old transfer looks like it's the victim of fogging! These next two shots also seem to be from different takes, since it was impossible to precisely match the position of Rotwang's hands, but again they show the improvement offered by the 2002 transfer. Note that the new image presents a more gradual shading across Rotwang's face, and the shell of the robot. It's impossible to convey the true quality of the restoration using still images, since they don't capture the flicker from frame to frame, or the distracting flecks of dirt and dust that mar the earlier transfer. It would be easy to be overwhelmed by the picture quality on the new version, but it shouldn't be exaggerated. There are still scratches, flicker and specs of dirt, but they are generally much diminished. (There are, of course, some sequences where, from necessity, the picture is blighted by photo-chemical decay). The disc encoding seems adequate, and doesn't appear to have introduced any noticeable artefacts of its own. The average bitrate is 7.47Mb/s. Eureka's disc presents the film in window-boxed format, offering an image that's very slightly smaller than a conventional 4:3 picture. The caption cards and intertitles are all in English. There are three audio options: two carry the film's original score, by Gottfried Huppertz, in either Dolby Digital 2.0 (at 224kbps) or 5.1 (at 448kbps) versions. The third carries a meticulously prepared running commentary by restoration guru Enno Patalas, which will significantly enhance most viewer's appreciation of the film. There are optional English subtitles for the commentary. 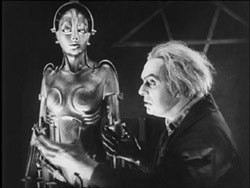 Patalas also created the forty-four minute documentary The Metropolis Case, which forms the core of the supplements on disc two. The documentary not only places the film within the context of the German film industry at the time (it was the last Expressionist film), but also within the wider scope of contemporary art. It examines the film's creation, explaining how some of the film's impressive special effects were accomplished (including the ambitious use of stop-motion model animation and in-camera trickery). It also explains how Goebbels and Hitler courted Lang in the hope that he'd work their own brand of national socialist cinema (ironically, this was despite banning M and Das Testament das Dr Mabuse!) This documentary is presented with 5.0 audio (at 448kbps), which is most effectively used during a section dissecting the film's music into its principal themes. The documentary features archive interviews with many of the key participants, including Lang, although sadly not with any of the lead actors. (Brigitte Helm, who was only nineteen when she made Metropolis, lived until 1996, but she left the acting profession in 1935, and subsequently refused to discuss her film career). The documentary (which is in English) is supported by optional English subtitles. As interesting as The Metropolis Case documentary is, I found the nine-minute restoration featurette, which shows some side-by-side split screen examples of the old and new version, more compelling. It shows some horrifying examples of nitrate decay, and some diametrically remarkable footage of the original separate elements for some of the special effects shots being re-composited. It's clear that he restoration team were well aware of the potential limitations of the new digital techniques. One segment shows the perils of excessive digital noise reduction techniques, which should be equally instructive to those who equate "digital" with perfection, and to those who are apparently oblivious to the reckless tampering that was so studiously avoided here. (It's ironic that many similar "cleanup" artefacts are present in the clips from other films featured in The Metropolis Case!) Another section of the restoration featurette shows how much difference a state-of-the-art wet-gate film transfer can make. It's a process that washes the film in a special liquid which temporarily fills in minor surface scratches - the cinematic equivalent of T-Cut!) It turns footage that looked like it had been rubbed down with a scouring pad to something almost entirely blemish-free. The second disc also offers an extensive, well-annotated photo' gallery that presents surviving stills from the huge chunks of the film which have not survived. There are also more modest galleries of production stills, architectural sketches, costume designs, and theatrical poster designs. There are also comprehensive biographical notes for the main cast and crew members. 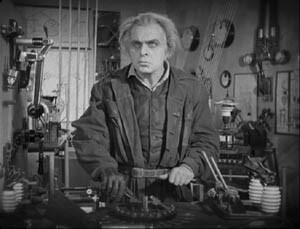 Eureka's disc offers fans of Metropolis the chance to see the film in an astonishing new transfer, bringing clarity and tonality to a movie era often represented in stark black and white. Despite that, it's probably worth hanging on to previous versions of the film on DVD, if you have them, if only to compare them to the 2002 transfer. 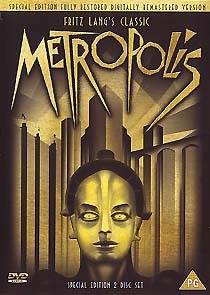 Make no mistake, though, the Eureka disc is undoubtedly the best way to see Metropolis in the home.